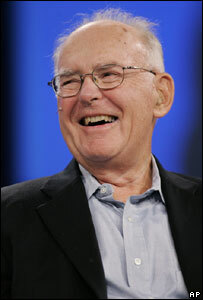 Gordon Moore: "It's not the end of the road." The next step in the silicon industry's steadfast pursuit of ever smaller and faster chips has been unveiled. Intel has shown off what it says are the world's first working chips which contain transistors with features just 32 billionths of a metre wide. Their production means the industry axiom that has underpinned all chip development for the past 40 years, known as Moore's Law, remains intact. Speaking to BBC News, Dr Gordon Moore said that he expected the proposition that bears his name should continue "for at least another decade". "Eventually, however, we're down approaching the dimensions of individual atoms and that's clearly as far as we can go down the path of shrinking dimensions," he told the BBC News website. The "law", first articulated in 1965 and then revised in 1975, now states that the number of transistors on a chip should double every 24 months. "It has become a driving force for the industry because competitors realise that if they didn't move at at least that rate they would fall behind technologically," said Dr Moore, co-founder of Intel. For the past 40 years this has primarily been achieved by reducing the size of transistors and packing more of them onto a chip. Transistors are the tiny electronic switches that form the basis of computer chips. The more there are and the faster they can switch, the more calculations chips can do. The next generation of Intel chips, which contain transistors with features just 45 billionths of a metre wide (nanometres, nm) pack 410 million transistors into an area the size of a postage stamp. The Penryn chips, as they are known, will be available from 12 November. Their successor, called Nehalem, will be launched in 2008 and nearly doubles the number of transistors on the chip, or die. "Each die on here has 731 million transistors," said Intel's CEO Paul Otellini, as he showed off the next-generation chips at the Intel Developer Forum in San Francisco. Other companies also plan to release chips based on 45nm technology, including IBM, which along with partners Toshiba, Sony and AMD, plans to sell chips in 2008. Working at this tiny scale is not without problems. Critical elements of the transistors, known as gate dielectrics, do not perform as well, allowing currents passing through the transistors to leak, reducing the effectiveness of the chip. To overcome this, Intel and others have replaced the gate dielectrics, previously made from silicon dioxide, with a material based on the metal hafnium. The exact recipe for the new material has not been revealed but its development and integration into working components was described by Dr Moore as "the biggest change in transistor technology" since the late 1960s. It is a so-called high-K material and has a greater ability to store electrical charge than silicon dioxide. This class of materials will also be used in the 32nm devices expected in 2009. 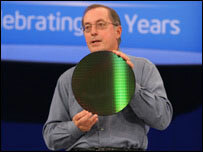 The first chips incorporating this technology were shown off by Mr Otellini. The memory chips contained 1.9 billion transistors. "What this does is start to give us the know-how, the confidence, to build mainstream microprocessors on this technology," said Mr Otellini. Using Moore's Law as their basis, silicon manufacturers have already planned beyond these next generation technologies. 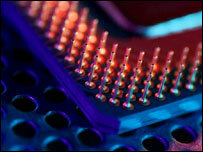 For example, devices with features 22 nanometres wide are expected to roll out of manufacturing plants in 2011. Eventually, however, the industry is expected to hit a physical barrier: transistors will not be able to be shrunk any further. At this stage, the chip industry may have to change the approach that has underpinned the last four decades of developments altogether. But, Dr Moore does not believe that it will spell the end. "It always looks like there is some very difficult problem but as we get closer the focus and the engineering that we bring to bear on it usually removes these barriers and allow us to go by them," he told the BBC. "There is still a lot of room for creativity - it's not the end of the road," he said.